This is such a fun writing unit to teach! This is Unit 4 in my kindergarten writing series. We are tackling “How-To” writing pieces, and my kiddos love it when I tell them they get to be the teacher. 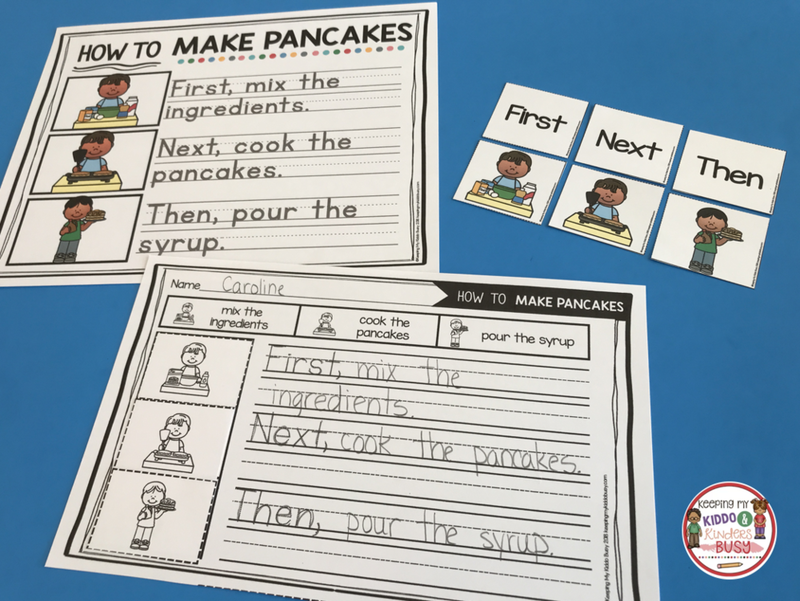 In this unit, students must explain "how-to" complete tasks such as make slime, pancakes, a sandwich, find a lost treasure, ride a bike, take care of a pet, etc. In Unit 3 - Narrative Writing we learned how to use sequencing words (when students were writing about themselves they could describe an event first___, next____, then____). Now we continue to use this skill of using transition words to explain how to complete a task. When I tell my students they get to be the teacher they could not be more excited to start writing! These adorable anchor charts are a great way to introduce “how-to” writing. I tell my students they have to give me directions. We start by role playing, just so students can see how tricky this task can actually be. I go sit in a student chair and one student has to tell me HOW TO come sit on the carpet. Believe it or not, they are sometimes stumped! If they just say, “Come sit on the carpet” I do not move. I make them give me specific directions such as: FIRST, stand up. NEXT, push in your chair. THEN, walk to the carpet. FINALLY, sit down criss-cross. This modeling is an excellent way to get students thinking about giving directions. I want them to practice using transition words too. I start the unit with these activities so students can see how to put events in order. These are an excellent way to have students practice giving directions on “how to” complete a task. I start by using the color cards in a pocket chart. We look at the pictures and discuss which order would make sense and why? Then we do the cut and paste activity. Students must use the word banks to complete the sentences as well as match the pictures to the sentences. Then you can use the color version to go over the answers with the class. These adorable cards match each cut and paste activity and make a perfect literacy center activity. 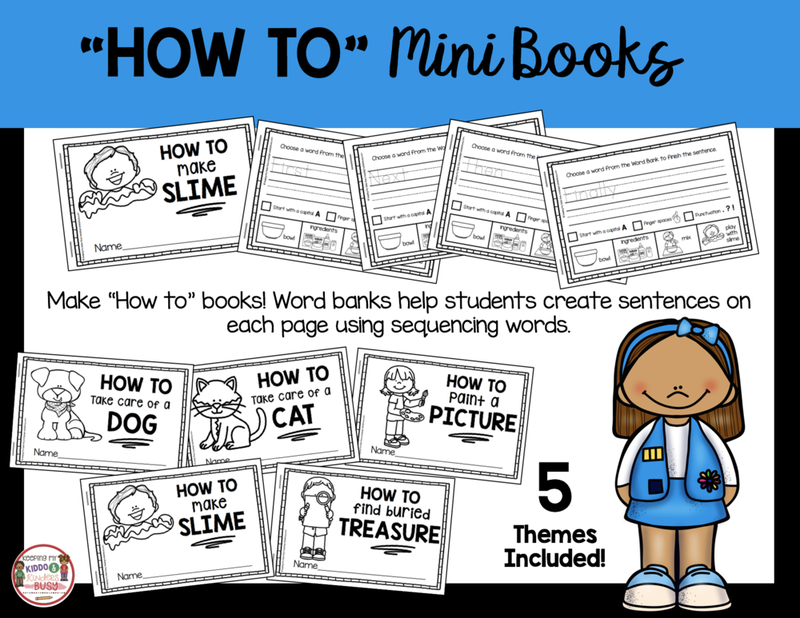 Another great activity to practice writing about how to complete a task are these adorable mini “HOW TO” Books. In these books, students must explain how to paint a picture, take. care of pets, make slime and find buried treasure. These are a similar format to the mini books in our Narrative Unit, so students are familiar with how to use the word banks to complete a sentence. This How to Make Slime book is a FREEBIE any the bottom of this post. Students trace the sequencing word, and then must complete the sentence using vocabulary from the word bank. In some of the books they really must think about what order would make sense to give directions. Then students can color the pictures and be sure to check the boxes that they used a capital, finger spaces and punctuation. Once students get the hang of “how-to” writing with the mini books, pocket chart cards, and cut/paste activities, I can introduce the “How to…” expository prompt poster. I provide different papers for writing if students need additional scaffolding. Students can’t say, “I don’t know what to write about!” I teach them how to choose a prompt from the posters, and they can get started! This format is also similar to the prompts and writing papers in the narrative unit. I love that once I have my students trained on how to use these resources, I can move them to a writing center to be used throughout the school year. My students appreciate the consistency and I love that they know what is expected and I am not constantly explaining new directions. How adorable are these writing crafts? 8 themes are included to take you through the holidays/seasons of the school year (only four are shown in the photo). You can copy the black lines on white paper and students trace the sentences, and cut/paste them in the correct order onto their craft. For example, “How To Catch a Leprechaun” theme is below. Perfect for a March bulletin board! After students trace the sentences and cut/paste them in order, they can then decorate their craft! They can paint, color and add embellishments. This is so fun and the perfect way to review “how to'“ expository writing throughout the year. Want to try a fun FREEBIE with your kiddos? This adorable Mini Book is available in our Exclusive Freebie Library. You’ll be able to print this freebie and more right away. Not a member yet? It is FREE to sign up and you can access this book and so many other free activities right away. This is the perfect explanatory / expository writing unit for kindergarten or first grade! This is the fourth unit in my new Kindergarten Writing Series. If you follow all of the units, I will be taking you from the the first few weeks in kindergarten all the way through the end of the year. They progressively get more difficult throughout the year as students’ skills develop. Ready to teach your students expository how-to writing? Check out the other units to start your year off right with kindergarten and first grade writing! The units progressively get more difficult as students skills develop throughout the year.